Includes our triple care colour ritual, 1. Caring colouring cream, 2. Caring gentle scalp post-colour shampoo, 3. Caring lightweight mask. Covers up to 100% of greys. Gentle on scalp & hair. Nourished, healthy looking hair. Natural, multi-tonal colour result. 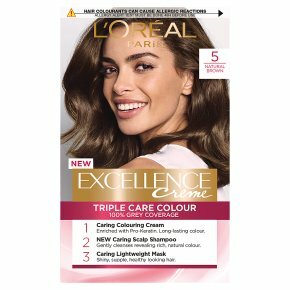 Triple Care Colour Ritual Hair Dye by Excellence Cares for your colour. Cares for your scalp. Cares for your hair. 1. Caring Colouring Cream Enriched with Pro-Keratin. Protects the hair as it colours. Long-lasting, multi-tonal colour. 2. Caring Gentle Scalp Post-Colour Shampoo Delicately cleanses the scalp and hair by gently rinsing away excess residue. Smooths the hair to reveal its radiance. Natural, multi-tonal colour result. Formulated specifically to be used right after colouring your hair 3. Caring Lightweight Mask Infused with conditioning ingredients. Intensively nourishes the hair without weighing it down.